While the United States was once a "Christian" nation, it is now a multi-faith one. Includes short overview of American religious history, and statistics of church membership. Submitted by author for posting here. About the book: World Religions: Belief, Culture, and Controversy is a virtual textbook that covers religion across the globe, making student research on faith and belief across humanity easier, and enabling a deeper understanding of the complex issues facing us in the 21st century. The database includes thousands of reference entries covering belief, celebration, practice and holidays, as well as important individuals, events, and places, along with scholarly essays and primary sources (images, video). 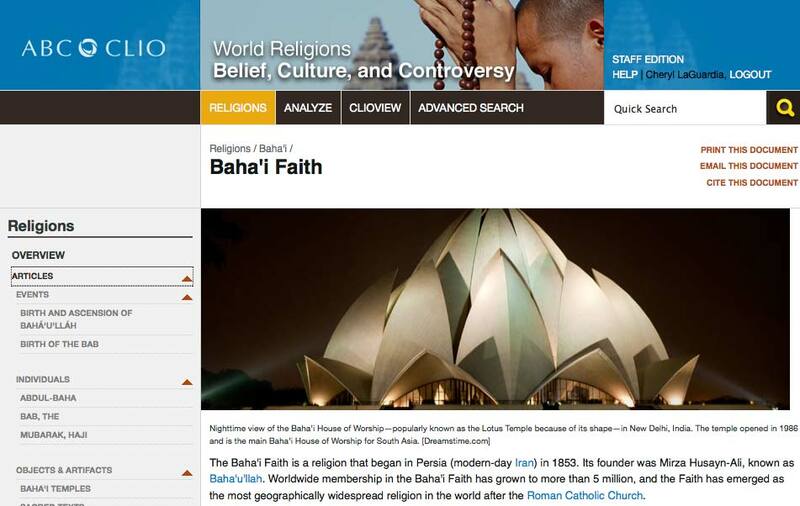 The Bahá'í articles are by Loni Bramson, Robert Stockman, Christopher Buck, Moojan Momen, Anthony Lee, Todd Lawson, et al. See it online at abc-clio.com/product.aspx?id=2147510322, and the Bahá'í topic page at religion.abc-clio.com/Topics/Display/1584364.